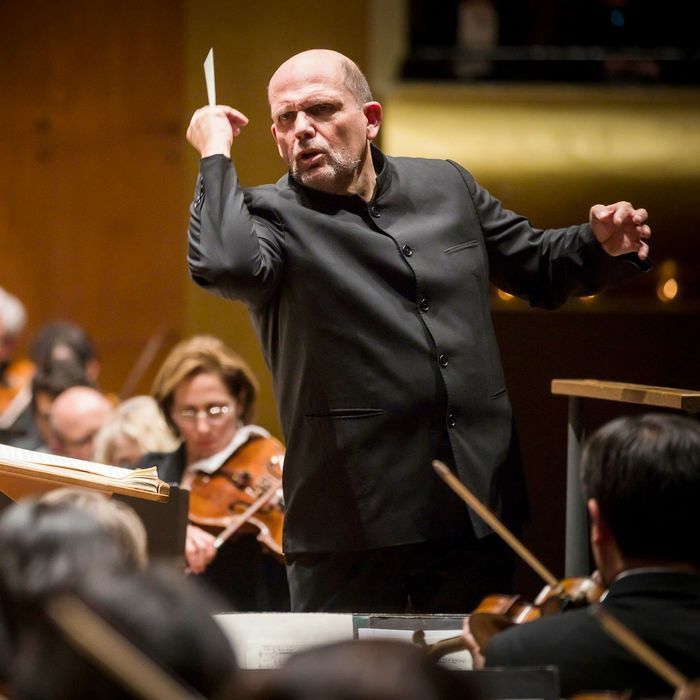 Jaap van Zweden, a Dutch maestro with a silhouette like a hip flask and a musketeer’s way with a baton, is making his first appearances with the New York Philharmonic since he was chosen to succeed Alan Gilbert as music director. He won’t officially take the post for nearly two years, but his high-speed performance of Tchaikovsky’s Fourth Symphony suggested he would love to hurry that date along. A superb technician with crystalline intentions, van Zweden seemed most at home laying down a covering barrage of brass or catapulting into a big crescendo. But the New York premiere of Julia Adolphe’s viola concerto Unearth, Release also proved that he’s no slouch with a glimmering pianissimo or a complex new score. The program (which the Philharmonic will repeat Friday and Saturday) is one of those old-fashioned, one each from columns A, B, and C affairs that remain the orchestra world’s lazy default: an overture, a concerto, and a big old symphony. Adolphe’s new work sits flanked by unrelated classics, which is about as effective a way of selling it as convincing a child to eat kale by clapping it between slices of cake: Neither the kale nor the cake is improved by the arrangement. Each part of the program gave van Zweden a chance to display a different skill. In Wagner’s Lohengrin overture, he coaxed the strings to unspool the endless melody as in a single, ten-minute exhalation. Only in the final seconds do they take a breath, and while many conductors sweep past that moment, van Zweden made it a percussive silence, like a gong strike before the final fade-out. As he moved through the overture’s long, seamless arc, from reverent hum to slow blast of brass and back again, he never left any doubt where the music was heading. He shaped the score with a worrisome sharpness, impressive but devoid of mystery. Adolphe, who at 28 qualifies as a bona fide phenom, has written a concerto that captures the fragile clarity of twilight. The viola does not naturally rocket above a low accompaniment or pierce a thick fortissimo. It’s never the loudest, highest, or lowest voice in the room. Instead, it must achieve prominence through charm and negotiation. That’s a job for Cynthia Phelps, the orchestra’s stupendous section leader, and Adolphe helps her by threading the dark, velvety viola through a shadowed orchestral landscape. The soloist flaps like a bat against a window in the first movement and skips lightly over the waves in the second. But it’s the final movement that lingers longest in the mind, the viola curling softly on a vaporous pillow of strings. I did not know while I was hearing that passage that Adolphe had subtitled it “Embracing Mist,” but I didn’t need to: The score conjures the image with wondrous precision, even without an assist from program notes. The Philharmonic could probably turn in an adequately thrilling performing of Tchaikovsky’s Fourth Symphony even if my dog were on the podium. The stupendous brass section would bounce through the fanfares at full tilt, the strings would pluck pizzicato magic in the second movement, and the night would end on a rousing and precise fortissimo. In a work this foolproof and familiar, the conductor doesn’t need to ensure a good performance; he can just get out of the way. Van Zweden didn’t take that option. Instead, he floodlit the symphony, yielding a landscape of deep blacks, sharp angles, and blinding highlights. Reading his future tenure from this one gig is like trying to extrapolate a marriage from a first date: It’s hard to separate the novelty from the clues. Still, the concert left me wondering whether in his eagerness to thrill the audience he’ll forget to seduce us.